Lucky Diamond brings vinyl record care into the 21st century with the ability to clean and protect your new and old vinyl records. Lucky Diamond is the first record maintenance solution that effectively cleans and protects vinyl record grooves with one product. Because Lucky Diamond reduces needle on groove friction, some skips caused by physical damage are able to be corrected! 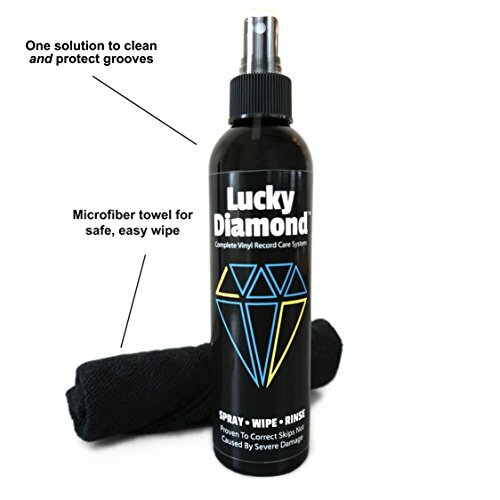 Lucky Diamond is non-toxic, solvent-free and clears static on contact. 8oz of record maintaning power! If you have any questions about this product by Lucky Diamond, contact us by completing and submitting the form below. If you are looking for a specif part number, please include it with your message. L'Art du Son SACD / BD / DVD / CD Optical Treatment/Cleaning Kit - Improves Sound! (6) RD1046 RCA Discwasher Record Cleaning D4+ Fluid Refill Bottles + BONUS FREE 3.25" 45RPM Record Adapter Sticker ! Vinyl Record Cleaner|Anti Static Carbon fiber & Velvet turntable cleaning brush|2in1 Portable use to keep your vinyl collections like NEW.